Drones are becoming increasingly important for surveillance and other purposes. But more air-borne drones mean increased chances of collision with other aircrafts – if proper monitoring systems are not put in place. In the same vein, Hazardous weather conditions like tornadoes and hurricanes are becoming increasingly rampant in more parts of the world and there also needs to be an effective preemptive warning system that’ll help in preventing cataclysmic eventualities. But, what if we had a radar system capable of preemptively detecting drones and hazardous weather? Well… very soon, we will! Existing aircraft surveillance systems and are usually located so high up in the sky and so far apart that they cannot effectively monitor what is going on in atmospheric regions close to the earth’s surface. For instance, the radars used by the National Weather service are located at least 100 miles apart and at very high altitudes, thus, they can’t see what is going on in the first couple hundred feet above the surface. This is the first major limitation catered for by this new dual-purpose radar system, as it is able to scan for atmospheric changes and drone movements in regions closer to the surface. At the inaugural phase of the project, 7 short-rage radars were installed in Dallas-Fort Worth (Texas) with the sole purpose of weather scanning. The system showed a high degree of accuracy in detecting tornadoes forming close to the surface and efficiently offered timely warning through its smartphone app. The system is now to be equipped with phased array antennas that uses multiple radar beams to perform atmospheric scans for high-speed drones. A rather unique aspect of the radar system it that it will utilize the dual polarization technology to accurately distinguish between flying drones and birds, as well as the specific kind of precipitation present in the air. This dual-purpose radar system will be particularly helpful in airports and other areas where weather and drone information are cardinal for public safety. 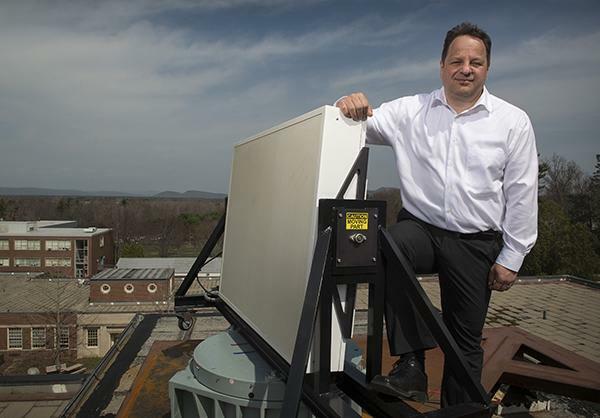 This project is being led by Michael Zink, an associate professor of computer and electrical engineering at the University of Massachusetts, Amherst, who is also the co-director of the Center for Collaborative Adaptive Sensing of the Atmosphere (CASA). The project is being financed by an 18-month $200,000 grant provided by the National Science Foundation. To learn more about drones check out Drone Age: Rise of the Flying Robots.